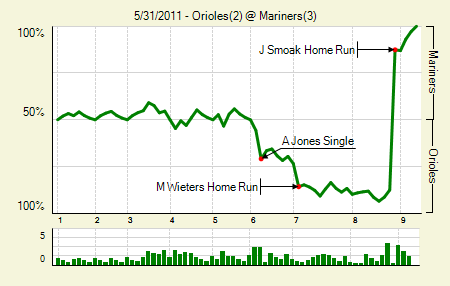 Moving the Needle: Justin Smoak ruins Jeremy Guthrie’s start with a three run homer, +.750 WPA. That’s one of the biggest swings you’ll see without a walk-off. Through seven Guthrie was rolling. He had struck out eight and allowed just three hits. Even in the eighth he should have been out of it, though it was kind of his own fault. With two down he got Ichiro to hit one on the ground. Luke Scott dived to field it and led Guthrie with a throw from his knees, but Guthrie didn’t catch it. Brendan Ryan followed with a single, and then Smoak hammered a hanger over the right field wall to flip the 2-0 deficit into a 3-2 lead. Erik Bedard: 6.1 IP, 6 H 2, R, 2 BB, 7 K, 1 HR. With Bedard healthy and effective, it’s little surprise that the Mariners have allowed the second fewest runs per game in the AL. Moving the Needle: Alexei caps the bases-loaded rally with a two-run single, +.122 WPA. 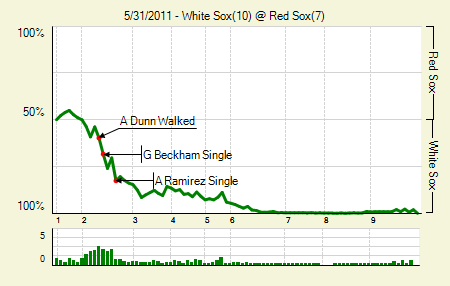 After two walks and a single, the White Sox had the bases loaded with one out. A single and then an error made it 2-0, and then Ramirez bounced one softly up the middle, allowing two runners to score. Ramirez added an RBI single later and went 4 for 5 on the day. Despite being down big, the Red Sox found some offense, scoring six runs in the final two innings. A.J. Pierzynski: 2 for 4, 1 2B, 1 BB. He’s having a crappy season, yeah, but he has the lowest strikeout rate in the majors among qualified hitters. Yet his 4.6% swinging strike rate isn’t particularly close to the league lead; that belongs to teammate Juan Pierre at 2.1%. Philip Humber: 7.2 IP, 9 H, 4 R, 1 BB, 5 K, 1 HR. I’m giving him a break on the four runs thing, because bequeathed two runners to Will Ohman, who wasted no time in surrendering a three-run blast to David Ortiz. Drew Sutton: 2 for 2, 1 2B. He came in as a we’re-getting-killed replacement for Dustin Pedroia, and went onto be a big part of the comeback bid. Moving the Needle: Logan Morrison extends the Marlins lead in the fifth with a homer, +.110 WPA. Ian Kennedy delivered one out over the plate, and Morrison just hammered it out to deep center, well above the 413 sign. 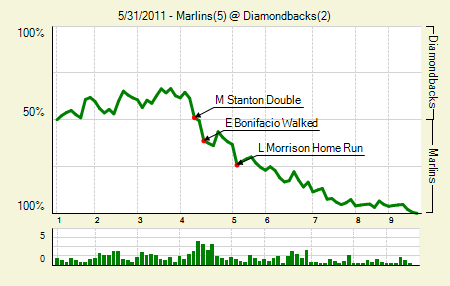 The shot gave the Marlins a 3-1 lead, and they’d add an additional run in each of the next two innings. Anibal Sanchez: 8 IP, 6 H, 2 R, 1 BB, 8 K, 2 HR. They were both solo homers, of course, but his FIP will rise after this one. Which is a shame, because he’s been kind of awesome this season. Gaby Sanchez: 2 for 4, 1 HR. The difference for Sanchez this year hasn’t been power; his ISO is just .012 higher. But his walk rate is nearly three points higher. Combined with a healthy BABIP spike, it’s made him one of the most productive first basemen in the league — which says a lot, considering the elite talent at first base. 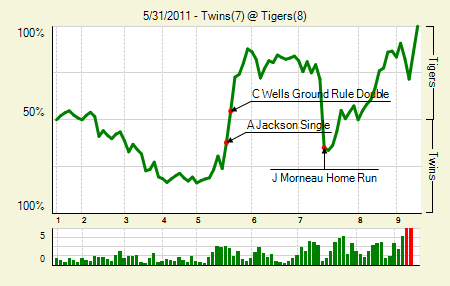 Moving the Needle: Justin Morneau puts the Twins ahead with a homer, +.367 WPA. It’s so sad when it happens like this. Morneau had one of those ‘I’m back nights’, going 2 for 4 with two homers and a walk. The second homer, which came in the seventh, put the Twins up 7-6. But the Twins bullpen got into trouble in both the seventh and the eighth, surrendering a sac fly in each, flipping the lead back to the Tigers. Morneau had another shot in the bottom of the ninth with the tying run in scoring position, but he struck out swinging. Victor Martinez: 2 for 5, 2 2B. It struck me yesterday, when writing about Adam Dunn, that Martinez, who signed a contract worth $6 million less, is working out quite a deal better. Jhonny Peralta: 2 for 3, 2 2B. There is a group of three MLB shortstops who have pulled away from the rest in terms of offensive production. Peralta is among them. Troy Tulowitzki is not. Moving the Needle: Freddie Freeman doubles the Braves to a lead, +.237 WPA. A rookie going through ups and downs in his first full-time season? No, never. Freeman has gone through that a bit in his first season as the Braves’ first baseman, but he’s gotten a little something going lately. Yesterday was his third multi-hit game in his last four, and one of them, a two-RBI double to the left-center field gap in the fourth, put the Braves on the board with an instant lead. 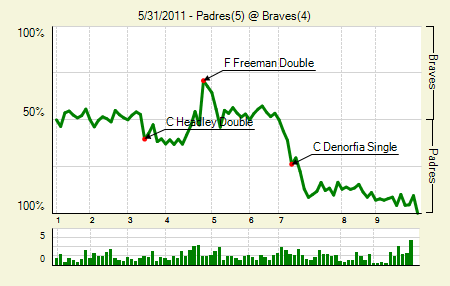 The Padres tied the game in the next inning, and then struck in the seventh to take the lead back. Chris Denorfia: 3 for 5, 1 2B. He has to rank among the best part-time players in the league, at least in the moment. Mat Latos: 6 IP, 5 H, 2 R, 4 BB, 7 K. The four walks are a bit concerning, but his second straight start with seven strikeouts is encouraging. Moving the Needle: Eric Hosmer gives the Royals a lead with a two-run double, +.148 WPA. Down 2-0 before they even came to the plate, it took a couple of innings for the Royals to warm up. But by the time they turned over the lineup, they were ready to roll. An error helped things out, putting runners on first and third with one out. Two singles tied the game, and then Hosmer put the Royals ahead with a two-run double to the left-center field gap. He’d later come around to score, capping a five-run third that would end up being the difference. Alex Gordon: 3 for 4. In a normal game he wouldn’t make it, but the three singles represented one of the game’s best performances. Jeff Mathis: 2 for 4, 1 2B. Ditto for Mathis, who won’t do this often. Moving the Needle: Matt Downs ties the game in the ninth, +.302 WPA. When you hand your closer the ball with a two-run lead and a clean inning, you expect him to finish the job. Carlos Marmol is certainly up to the task in general, but he was not yesterday. The Astros opened the frame with a single and a double, and then Matt Downs lined one past the outstretched glove of Aramis Ramirez and into left field for the game-tying double. A sacrifice and a single later, and the Astros had taken the lead. They’d add some insurance later in the inning with a three-run homer. It was all the more disheartening for the Cubs, since they scored three in the bottom of the eighth to take the lead for the first time. Carlos Zambrano: 8 IP, 7 H, 1 R, 0 BB, 7 K, 1 HR. Nothing to blame him for here. Aramis Ramirez: 3 for 4, 2 2B. He capped the eighth-inning rally with some much-needed, though ultimately insufficient, insurance. Jordan Lyles: 7 IP, 5 H, 2 R, 0 BB, 4 K. That’s a notable major league debut if I’ve ever seen one. The two runs only come because he started the eighth inning. Hunter Pence: 3 for 5, 1 HR. That’s a dozen straight with a hit, during which he is 23 for 51 with five doubles and three homers. 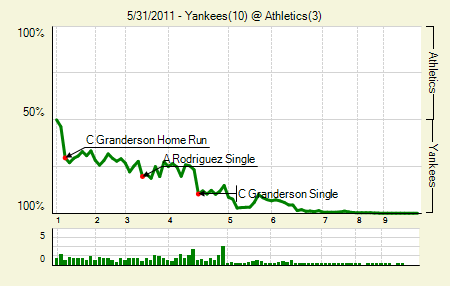 Moving the Needle: Curtis Granderson homers to give the Yanks an early lead, +.167 WPA. As they did a day prior against Trevor Cahill, the Yankees jumped on Brett Anderson in the first. 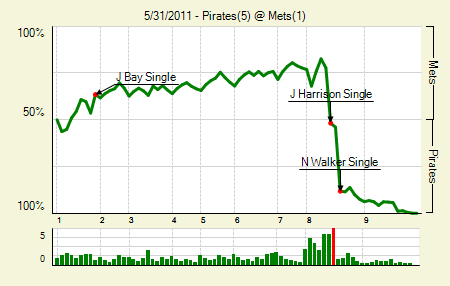 Curtis Granderson did the major damage, rocking a two-run homer before Anderson could record an out. The Yankees would come back with at least one run in every inning from the third through the sixth. For Granderson, who singled twice and drove in two more runs later in the game, it was his 17th homer of the year. That puts him in second place by himself. It was also his ninth homer against a left-handed pitcher, which leads the league by three. Andy LaRoche: 2 for 3, 1 3B, 1 BB. The good news: LaRoche is hitting considerably better than he did last season. The bad news: that’s a poor measuring stick. Alex Rodriguez: 3 for 4. It’s tough sometimes to find notables when a team has 12 hits, 10 of which are singles. A-Rod leads all third basemen in WAR, thanks to a rejuvenation of his UZR. Also thanks to a few key injuries at the position. 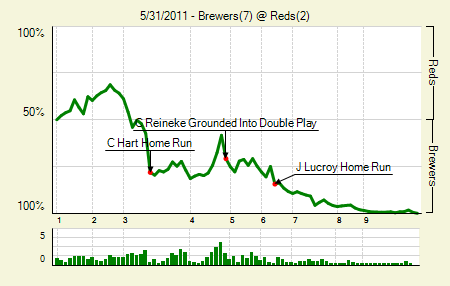 Moving the Needle: Corey Hart’s three-run homer puts the Brewers ahead, +.208 WPA. The Brewers took advantage of an inning-opening error in the third to start a four-run rally. It started with a Nyjer Morgan RBI single, and ended with Hart’s uppercut shot over the center field wall. Hart would add an RBI single later in the game. Zach Greinke: 6 IP, 6 H, 2 R, 3 BB, 6 K. Again, things are just shifting his way. I can just feel one of those CC Sabathia-type second half runs for Greinke. Jonathan Lucroy: 1 for 4, 1 HR. His .372 wOBA is tied with Russell Martin and Chris Iannetta for second among catchers. Problem is, he has far fewer PA than those two. 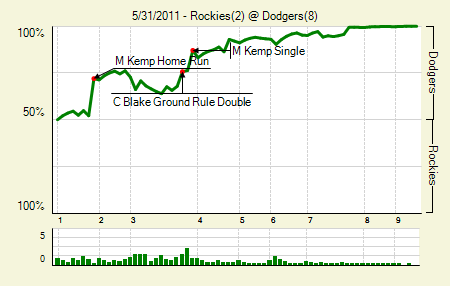 Moving the Needle: Matt Kemp’s two-run homer gets thing started in the first, +.198 WPA. When you leave an 87 mph pitch right over the heart of the plate, Kemp will often pulverize it. That’s what happened to Clay Mortensen last night. Kemp’s 13th homer staked the Dodgers to an early 2-0 lead. Two innings later he’d add a bases-loaded, two-run single to give the Dodgers a 4-1 lead. Ted Lilly: 7 IP, 4 H, 2 R, 0 BB, 8 K, 1 HR. After heading to the Dodgers last August, Lilly had five games with eight or more strikeouts. Before last night his 2011 season high was six. Casey Blake: 2 for 3, 1 2B, 1 HR. He has only 83 PA this season, but he has absolutely killed them. He’s really upping that trade value. 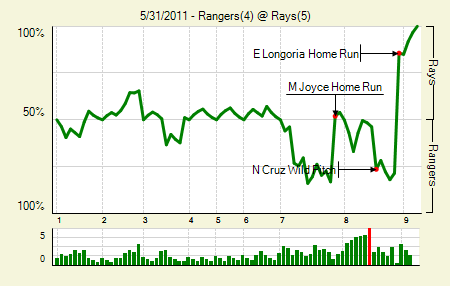 Moving the Needle: Evan Longoria hits a huge eighth-inning, two-out, two-run homer to give the Rays the lead, +.642 WPA. That’s two dramatic eighth-inning homers that have caused massive WPA swings. Down 4-3 with a runner on first and two outs in the bottom of the eighth, Longoria popped one off the top of the wall in left and into the stands, giving the Rays a 5-4 lead. It’s a pity, of course, because Mark Lowe had retired three straight, but Arthur Rhodes came on to face the lefty Johnny Damon with two outs in the eighth. He allowed a single and then the homer. Matt Joyce: 1 for 2, 1 HR, 1 BB. Dude has a .457 wOBA, which is second in all of baseball. Yet he hit seventh. C.J. Wilson: 6.2 IP, 3 H, 3 R, 4 BB, 10 K, 2 HR. Surprisingly, despite the two homers none of his walked batters scored. He retired 10 straight after the first homer. Moving the Needle: Danny Espinosa’s three-run shot gives the Nats a 5-0 lead, +.163 WPA. 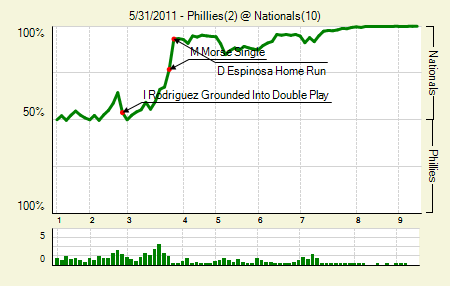 Espinosa had a grand ol’ time off Cliff Lee last night, socking two homers. 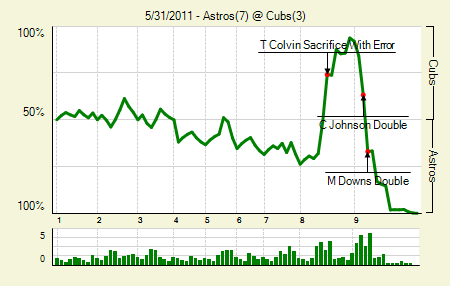 The first was the most devastating, though, as it capped a five-run third inning. It looked like he was cheating on the pitch, as he jumped out in front and whaled it into the bullpen in left-center. He now has 10 homers on the season, which would rank second among shortstops if he qualified for the batting title. Mike Morse: 3 for 5, 1 2B. It’s odd that in a 10-run game only two players on the 10-run side had multi-hit games. Jason Marquis: 6.1 IP, 8 H, 2 R, 0 BB, 4 K, 9 GB. I didn’t think he’d fare at all well against the lefty-heavy Phillies. While it wasn’t pretty, it got the job done. Moving the Needle: Grady Sizemore gets things rolling with an RBI double, +.095 WPA. Slowly but surely must have been the Indians’ motto last night; they scored six runs, one at a time. 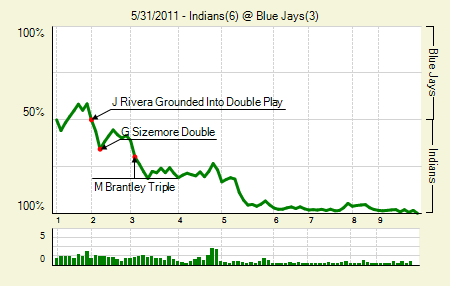 Sizemore started it in the second when he doubled home a runner from second to give the Indians a 1-0 lead. The Indians would then get two in the third and three in the fifth, giving them plenty of cushion despite the plodding pace. Jose Bautista: 3 for 5. Three singles? Joey Bats, you disappoint. Carlos Santana: 3 for 3, 2 2B. He seemed to be right in the middle of the action, driving in two and scoring two himself. Mitch Talbot: 6.2 IP, 6 H, 1 R, 3 BB, 3 K. It’s not pretty, but to say it’s an improvement over his previous start is to say — well, we’d better not say anything, because it’d be silly. Moving the Needle: Neil Walker breaks the 1-1 tie in the eighth with a bases-loaded double, +.342 WPA. Pitching with a partially torn plantar fascia, R.A. Dickey rolled through seven, allowing just one hit, a double to lead off the game, and one walk. But in the eighth everything fell apart. He allowed a leadoff single and then got the next two batters. He then hit a batter, surrendered a game-tying RBI single, walked another guy, and then gave up the go-ahead single to Walker. Dickey struck out 10 in the game. James McDonald: 6 IP, 6 H, 1 R, 2 BB, 5 K. Another good, if short, start by McDonald. Praise Octavio Dotel. Josh Harrison: 2 for 4. Not bad for the kid’s major league debut. Moving the Needle: Allen Craig ties the game in the eighth with an RBI double, +.303 WPA. The Giants had a 3-1 lead heading into the bottom of the eight, but then Cardinals got doubles happy. 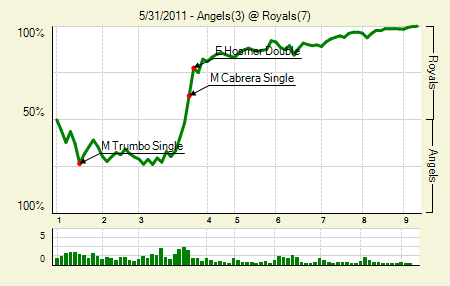 Jon Jay hit one, Albert Pujols hit one, and then Craig hit one, tying the game at three. 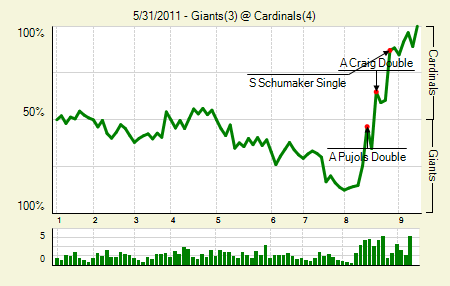 The Cards would get the go-ahead run on a Skip Schumaker single later in the inning. Those were, by the way, the only extra base hits in the game for the Cards. Chris Carpenter: 5 IP, 7 H, 2 R, 2 BB, 8 K. The strikeouts are always appreciated, but they helped Carpenter rack up 103 pitches in those five innings. Ryan Vogelsong: 5 IP, 6 H, 1 R, 2 BB, 3 K. At 91 pitches he probably could have gone the sixth, but with a runner on second and one out in the top of the sixth they pinch hit for him. Such is NL baseball. We hoped you liked reading The Morning After: Game Recaps for May 31st by Joe Pawlikowski! Okay, count me as one that was ready to write the Rays off earlier in the year. I figured their good fortune had taken a year (or two) off. I don;t know what kind of off-season conditioning routine Matt Joyce used, but it must have included knitting hats for premies, playing checkers with the elderly, helping baby boomers set up their iphones, feeding the hungry, and befriending Shannon Dougherty …. because that dude is enjoying some seriously good ju-ju.